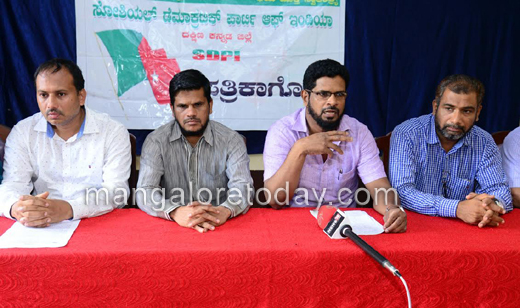 Mangaluru, May 30, 2017: SDPI alleges involvement of RSS leader Prabhaker Bhat in Kalladka stabbing case on May 26, as two youths were on their way back from mosque after Friday prayers. He also said that these incidents disturb the peace and harmony of the place too.The police have to be alert as this is the holy month of Ramzan, so that any incident of such not repeat in future. Iqbal Bellare, Ashraf Manchi, Zakaria, Shahul S H and others were present.